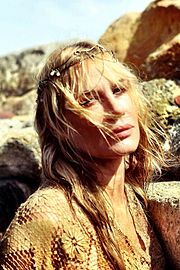 Daryl Christine Hannah (born 3 December 1960) is an American actress and activist. When people talk about reincarnation, I always feel that if there is such a thing, this is definitely my first time, because I'm always amazed. I'm both amazed at how horrifically we can treat each other and all other living things, and also amazed at the wonder and the beauty. I'm like: 'Oh my God, look at that bird!' or 'Look at that flower!' literally every single day. I can't get over how people are putting so much energy and so many resources into going to Mars when everything we could ever dream of is on this planet, if we just take care of it. What do they have on Mars? They don't even have oxygen up there! "'I'm a little bit of a nerd'", interview with The Guardian (7 June 2009). [At age 11] I noticed this truck full of calves and bonded with one in particular, who kept kissing me. After about an hour the truck driver came out of the restaurant. I asked him what the calf's name was, and he said, "Veal, tomorrow morning by 7 o'clock." That was it: I could no longer disassociate the creature from what was on my plate. About her vegetarianism. "One on One with Daryl Hannah", interview with Vegetarian Times (7 April 2010). This page was last edited on 25 November 2018, at 11:33.